New BCW faculty in 1962. 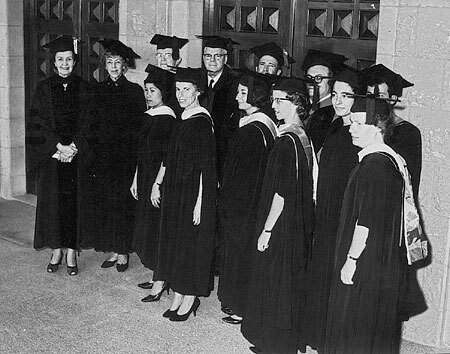 The tributes poured in when Frances M. Gray resigned as Beirut College for Women’s third full-time president in 1965 and the kudos continued well after she left Lebanon thanks to her sustained close ties and dedication to the institution. It was only fitting that the same spirit that marked her dedication to the cause of a liberal arts education, notably the humanities, envelop the lives of those who knew her well and were saddened by her departure December 15, 2001, weeks short of her 92nd birthday, following a valiant struggle with cancer. “She was a gracious, highly intellectual person who had great commitment to a liberal arts education and to the education of women in the world,” said LAU President Riyad Nassar. During the years he and his team developed the small liberal arts college, formerly known as Beirut University College, into the Lebanese American University, she provided much support, he said, adding that she had expressed appreciation for the fact that LAU had maintained a liberal arts education as the base for all the institution’s professional studies. “I have admired Ms. Gray for being a true Christian in her beliefs and values but with great tolerance and understanding for other customs and beliefs,” said Dr. Nassar. According to Vice President for Development Robert Stoddard, Ms. Gray embodied the spirit of the missionary founders of the American Junior College for Women. “She was first and foremost an American Presbyterian educator whose mission in life was to help break down the barriers of prejudice by providing educational opportunities for all—but most especially for young women in the Middle East,” said Stoddard in his tribute. He added that it was evident from her achievements in Lebanon and Iran that Frances Gray fulfilled that mission. According to Mrs. DeLancie, Ms. Gray’s faith was unshakable and she never feared death. “In fact, when her doctor proposed radiation treatments when the cancer was found to have metastasized, she refused, saying: ‘What for? I want to be promoted. I’ve had a wonderful life and it’s time.’ That’s how we should remember her,” added Mrs. DeLancie. Ms. Gray’s grace and southern charm were coupled with a steely resolve to raise standards of the faculty and the curriculum as well as improve and expand facilities, which she pursued with relentless determination. Ms. Gray, who was born in Little Rock, Arkansas, lived in Memphis, Tennessee, where she attended college. But her devotion to learning prompted her to acquire an M.A. from the University of Chicago, an M.S. from the New York School of Social Work, Columbia University, and a Master of Religious Education from the Biblical Seminary of New York. She also earned an honorary doctorate from Whitworth College in Spokane, Washington. Her career took off when she chose to be a social worker in Chicago and later moved on to Arkansas’ State Welfare Department. During World War II, she served with the American Red Cross in Europe and worked for the Commission on Ecumenical Missions and Relations in the United States. 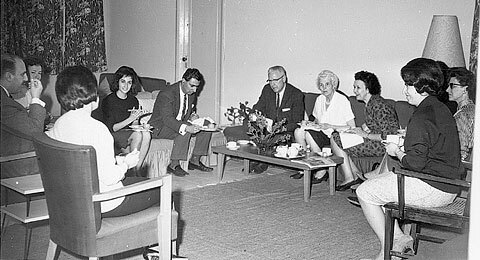 The Commission assigned her to establish medical/social casework services in Asia in 1949, which, fortuitously, brought her to Lebanon for the first time. The attraction made her return in 1956, this time as a teacher of religion and social work at the College. The words were followed by deeds, notably establishment of a 40th Anniversary Campaign to raise funds for the institution. She secured the first grant for BCW from the Ford Foundation, to the tune of $1 million. For her service in the region, Ms. Gray was the recipient of the Gold Medal of the Cedars from Lebanon’s president and the Order of the Taj, a decoration given by the late shah of Iran in 1975. “It was a joy to work with her,” recalled Dr. Raja Hajjar, a former professor of chemistry and former dean at BCW/BUC. He remembered her saying she had hoped the college atmosphere might always be that of a family, a community of learners, both of students and teachers, who ardently sought and shared ideas and ideals with each other. “She was a humble and caring individual, who always paid attention to the needs of the little people,” said Youssef Al-Rassi, a theater technician at the Beirut campus, recalling that he was hired the year Ms. Gray became president. The fond memories will always remain. “Six long years of tireless effort as president of the College will link the name of Frances M. Gray with BCW forever,” wrote Lily Sawaya (AA ‘35) in a fond farewell marking Ms. Gray’s retirement at the time. LAU is conducting a special campaign to raise at least $25,000 to establish a Frances M. Gray Endowed Scholarship Fund. Interest from this fund will provide financial aid each year to a deserving female student in need. Those wishing to honor President Gray’s memory and acknowledge her contributions to women’s education in the Middle East, are invited and encouraged to contribute to this fund. Gifts and pledges may either be given to a development officer or sent to the University’s development offices in New York (475 Riverside Drive, Suite 1846, New York, NY 10115) or Beirut (P.O. Box 13-5053, Chouran Beirut 1102 2801, Lebanon). It is also possible to make a gift by credit card by writing or calling the New York office, (212) 870-2592.